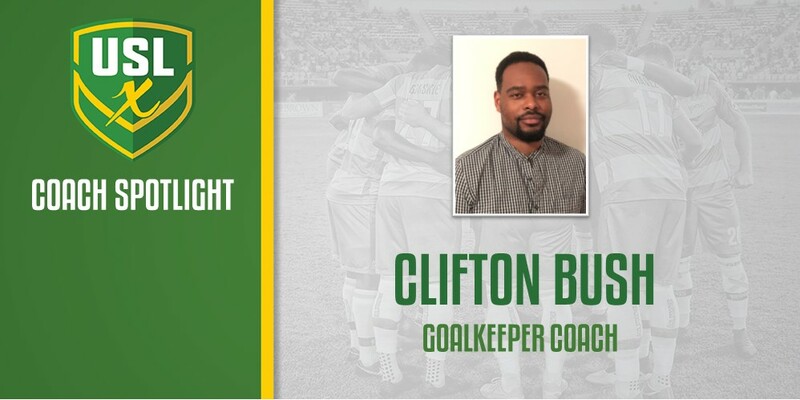 When Clifton Bush attended the 2018 Super Y League Finals, he was invited to speak amongst many of the young players present that are hoping to make it at the next level of soccer; college. It was an opportunity that was not only beneficial for the players in attendance but also for Bush, who continues to acclimate himself with the Super Y landscape. Among the many points he hit on during the event was the importance of a player’s willingness to not only excel on the field but also in the classroom. Bush will return to Tampa in April for the 2019 USL Experience, where he will serve as a goalkeeper coach for the U15/16 Boys group. For him, it’s another chance to see these young players develop on the fly. “I was fortunate enough to have attended the Super Y League Finals last year and had a platform to speak at the College Coaches Panel,” Bush told SYLSoccer.com. “The level of engagement in the college talk was really encouraging. I think it’s really important that these kids take an interest in their future, especially when it comes to college. “We need more athletes to take responsibility for their future and Super Y offers great exposure for them to be able to do that. On the field, there are many players that meet the criteria we are looking for at the next level, and I hope to engage with more players and coaches over the next year. Bush’s role at the 2019 USLX will be a bit different than SYL Finals, however, his end goal remains the same when it comes to coaching background. For the UNC Asheville women’s interim head coach he says he is looking to help guide the players in attendance at USLX towards positive tendencies and mentalities on the field which will help boost their chance of success as their careers progress. “I’d really like to accomplish three things,” Bush said. “First, my goal is to foster the most professional atmosphere these players can manage. It is important the concepts I teach push the players out of their comfort zone and help give them a glimpse of what the next level is really like. “If I can impact these players to think creatively and make better choices more frequently that would be a huge win. I’ll try to facilitate games with multiple solutions to a situation and hopefully help them pick the correct technique for them. Bush also offered up some advice for players seriously considering the prospect of continuing their playing career at the collegiate level. “I believe there is a place for every athlete out there if they just do the work to find the right fit for their skills, academics and social needs,” Bush said.